Kyosho has built everything from static models to basic hobby-level kits throughout its 50-year history, but the Japanese firm is perhaps best known for producing some of the most exotic and successful race cars the RC market has ever seen. The most notable id the Inferno series of 1/8-scale buggies that have won eight IFMAR World Championships, more than every other manufacturer put together, including an incredible six in a row. It takes a special combination of both car and driver to win the Worlds, so it comes as no surprise that the man behind the design of every Inferno since the original debuted in 1992 is a World Champion himself: Yuichi Kanai. 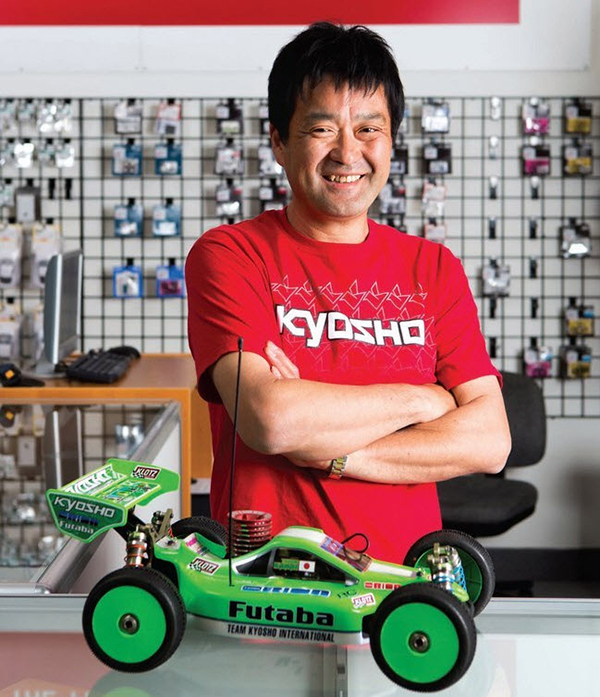 The head designer of Kyosho’s 1/8-scale buggy line for well over 20 years is also a very accomplished racer, having won an IFMAR World Championship, and while he was visiting the U.S. to compete in the 2013 Silver State Nitro Challenge, I had the exclusive opportunity to interview him We spoke with Yuichi about his career and how he has watched off -road racing change over that time. RC Car Action: How did you get started in racing, and how old were you? Yuichi Kanai: I was 13. I really liked the idea of getting involved, so I got started on my own. I started in 1/8-scale buggy. It was very different from what we are seeing today. Thirty-five years ago, the buggies didn’t look anything like they do now. 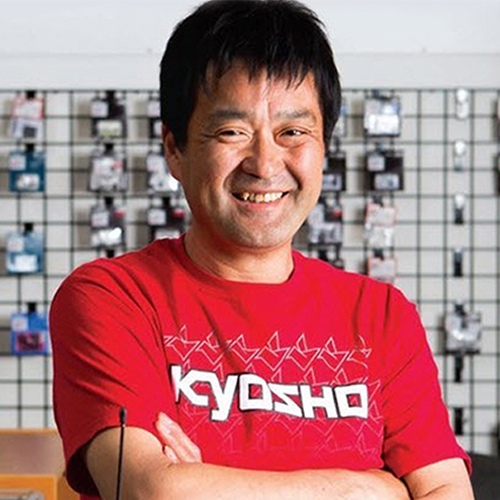 RCPR: When you started working at Kyosho, were you designing cars right away? YK: I studied for about a year and then started designing. RCCA: So, you had to learn as you went — learning what part of the cars did what so that you could make changes? YK: Basically. Plus I really liked it, so it was interesting to learn. RCCA: You were obviously involved with racing right away. Is that what led you to designing better race cars … because you were so interested in racing to start? YK: While I’m racing, I’m always thinking about what could make the car better. If something pops into my head, I’ll make a prototype and try it right away. That’s how I develop something new. RCCA: How did your racing career progress from racing at local events in Japan to national and international events, and winning the 2000 IFMAR Off -Road Worlds? YK: The first international race that I did was the first IFMAR Worlds for 1/8-scale buggy (in 1986 in Grenoble, France). In fact, I think I’m the only one who has raced at every Worlds event for 1/8-scale buggy – not many people can say that. I’ve won the Japanese National Championship eight times, the first one about 12 years after I got into RC and about five years after I started racing professionally. RCCA: How much different is the racing scene in Japan than it is in the United States? YK: There are a lot more people here, obviously. People have more fun in the U.S.; in Japan there’s a lot more tension. Racers here seem to have more fun and in Japan they can take it too seriously. RCCA: What has been your favorite part of traveling to all of these international events over the years? YK: Pretty much everything. In particular, watching how things have changed. For example, the tracks in Europe seem to be becoming more like American tracks, what you would call “Supercross” style. European tracks tended to not have many jumps, but now they’re starting to have jumps like here and they’re getting very good at it. RCCA: Of all of the different places that have hosted the World Championships, which have been your favorites? YK: The one that sticks out is the 2000 Worlds in Las Vegas, NV. The track was constructed specifically for the race, so everyone had equal experience on the track. No one had run that track before, so it was equal for everybody. RCCA: You’re the lead designer of Kyosho’s Inferno series of 1/8-scale off-road cars, but you didn’t design the first one, the MP-1 Burns. You’ve designed every one of them since? YK: Yes. The series started with the MP-1, Burns. MP-2, Turbo Burns. MP-3, Inferno. MP-4, Turbo Inferno, and then MP-5, MP-6, MP-7.5, MP-777, and MP9. We started making the Inferno when we won our first World Championship (Kokushi Toge in Usingen, Germany in 1992). RCCA: When Kyosho released the MP-777, it was in celebration of winning six straight IFMAR titles. What is the sense of accomplishment when one of your cars wins something so prestigious? YK: What’s even more important, I think, is that all of the wins have been by different drivers. It’s important that anyone can drive a Kyosho car and win. One of my goals is to never go to a race like that with a prototype car, but for the team always to use production cars to show that they can win. RCCA: How important is the feedback of the team drivers to the development of a new design? YK: I typically try to make the decisions on my own instead of listening to the team drivers. Because I race on my own, when I think of something that may work better, I try it out first. That’s how Kyosho’s car designs have evolved. RCCA: Well, you’ve certainly had a great record of making the right decisions! YK: (laughs) I run on a lot of different tracks and am always thinking about how to make it better, but I don’t take a look at other manufacturers’ cars. I have never in my career looked at a competitor’s car to try and figure out what to do next. I’m sure there may be some things that are good on other cars, but I don’t want to copy anything so I just don’t look at the other cars. RCCA: What do you think has been the biggest change in cars over the past 20 years? Is it that the shocks have gotten better, the overall design of the car, the layout? YK: They’re much lighter. They’re more compact, require less maintenance, and the cars are much simpler. At first glance, the cars look similar, but if you focus on the details, there have been a lot of changes. A lot of the other manufacturers make the cars look good visually, but it can make the car harder to work on. I’m not looking for the car to be a supermodel, but more like a wife. Supermodels may look good, but you always love your wife! RCCA: When you design something new, what is the most important factor? Is it to be faster on the race track, to be more durable, to be easier to work on? YK: To look cool and to be easier to work on. I want customers to look at the car and think it has a really cool design. RCCA: How much influence does customer feedback have over your design process? YK: For me, it’s always been designing what I think is right. If you start listening too much to feedback from consumers, the car loses its direction. I design the car and body on my own because I want to be 100% responsible. It’s not that we don’t consider what the customers are saying, because I want them to be satisfied when they buy the product, of course, but I take 100% pride in what I design. RCCA: Is it tough to design a car that will work on different style tracks all around the world? YK: It’s not really difficult, I guess. Naturally, I try to design a car that will work all over. That’s why it’s important that I go and race on different tracks all around the world. One of the biggest advantages I have is that a lot of the designers don’t really run at a top competitive level and don’t drive as fast. I still do, and design at the same time, so that’s an advantage when designing a new car. RCCA: How do you feel, then, when a competing company comes out with a new car that looks similar or copies something that you’ve done? YK: I’m thankful for that, actually. RCCA: Imitation is the sincerest form of flattery? RCCA: How long does it take to design a new car? YK: I don’t know, really. The MP9 took about six months, though. RCCA: Last question: What do you think we’ll see on the next Inferno? YK: (laughing) I want to know that myself!